Since the iPod nano’s debut in 2005, Apple has rolled out notable changes to the player’s design every fall, almost like clockwork. Yet when Apple updated the iPod line at last week’s media event, the most notable thing about the latest iPod nano is that it didn’t change—at least not on the outside. Indeed, you’ll be forgiven if you thought the “new” iPod nano looks a lot like last year’s model ( ). That’s because in terms of hardware, the nano hasn’t changed at all. What has changed is the price ($129 for 8GB of storage or $149 for 16GB, compared to $149 or $179, respectively, last year) and the software. But if you’ve already got a sixth-generation iPod nano, the good news is that the hardware similarities mean that you can get all of the new iPod nano features via a simple software update, available when syncing your nano with iTunes. So what’s new in version 1.2 of the software for the sixth-generation iPod nano? Here’s a quick rundown. The original sixth-generation nano debuted a 1.54-inch, 240-by-240-pixel, multitouch screen, with software that, while not actually based on iOS, looked and felt very iPhone-esque. The screen displayed small icons—four at a time—for various features and functions; these icons were essentially analogous to iOS apps for Photos, Music, Settings, and so on. (I’ll call them apps for brevity.) You swiped your finger across the screen to scroll between screens of icons, and tapped on an icon to access the corresponding functions. If a function presented a list of items—for example, music tracks—you swiped up and down to scroll the list. As I noted in my review of the original sixth-generation nano, this new iOS-like, touchscreen approach was a significant improvement over the traditional Click Wheel interface for many tasks. For example, it was ideal for flicking through and zooming photos, tuning and setting presets for the built-in FM tuner, scrubbing through tracks, rating tracks, and editing playlists. However, the nano’s tiny screen meant that, with four tiny icons per screen, it was easy to accidentally tap the wrong icon. Version 1.2 of the iPad nano software maintains the iOS-like interface, but with a few significant changes. The first is that instead of displaying four tiny icons per screen, the nano now displays only a single, much larger icon at a time; as before, you swipe left or right to view other icons, and tap an icon to access its functions. While the app icons and background appearance are otherwise identical, the new interface feels more like Apple’s Cover Flow feature, as you always see the edge of the icons to the left and right of the current one. It’s also much easier to tap a particular icon, especially when walking or exercising. Note that if you want direct access to one or more of these sub-items, you can add them to the Home screen via the Settings app’s Home Screen settings; you can also revert to the four-icons-per screen view. As with versions 1.0 and 1.1 of the nano software, you can also disable any item—except for Now Playing and Settings—you don’t want to see on the Home screen; and you can rearrange icons on the home screen by tap-holding on any icon until all icons start shaking, and then dragging the icons around. 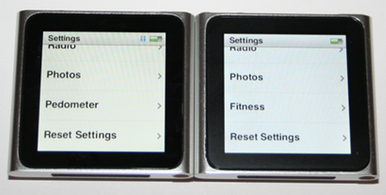 These are welcome changes that make the iPod nano’s tiny touchscreen a bit more usable. However, once you get inside each app, the interface is largely unchanged compared to iPod nano software 1.0 and 1.1. For example, the nano’s tiny screen doesn’t leave room for navigation buttons, so exiting an app sometimes—but not always—required a left-to-right swipe. The result remains an interface that you often learn by trial and error. And when browsing lists, the small screen still often allows you to see only three and a half entries—track names, artist names, and the like—at a time. One of the cute—and surprisingly popular—features that debuted on the sixth-generation nano was a full-screen clock. Tap the clock icon on the Home screen, and you see an analog clock face; under iPod nano software 1.0 and 1.1 you could choose, via Settings, black hands on a white background, or white hands on a black background. This feature, combined with the nano’s size and shape, led to a cottage industry for iPod nano watch bands—accessories that turned the nano into a makeshift wristwatch. 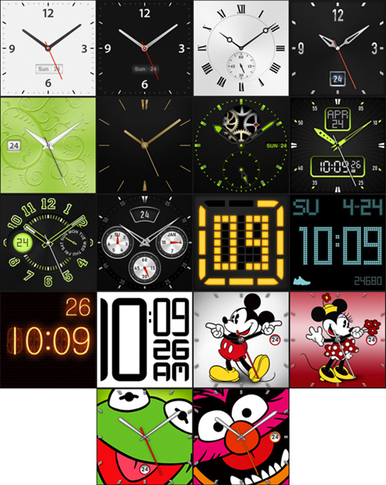 The 1.2 software update makes this feature more versatile by providing 18 different clock faces: nine analog, four digital, one analog/digital, two Disney analog (Mickey and Minnie Mouse), and two Muppets analog (Kermit and Animal). Most clock faces also display the current date. Interestingly, four of the analog faces are matched to the actual color of your iPod nano, so if you’ve got a green nano, the face has a green background or green highlights, while those elements would be silver on a silver nano. It’s a nice variety of clock faces, although I found myself wishing for a couple more digital offerings—namely a basic digital face, and a flip-clock-style face. The update also adds a few more options for wallpaper (the image displayed behind the Home-screen icons), upping the total on our silver iPod nano from nine to 12. The clock still feels like a gimmick at times. For example, it adds yet another tap—to dismiss the clock—before you can perform any action after waking up the nano, and since there’s still no setting for adjusting the length of time before the nano’s screen goes to sleep, you end up performing this extra tap frequently. Still, if you’re a fan of the nano’s clock feature, it’s a bit more fun now. The 1.2 software update provides a significant improvement here, and one that’s sure to be a welcome change for fitness fans: The iPad nano can now us its built-in accelerometer as the Nike+iPod sensor—not only is the dock-connector dongle no longer needed (much like with the iPod touch), but you don’t even need a Nike+iPod sensor in your shoe. In other words, you can now use Nike+iPod with any shoe brand and without having to spend more money for the sensor and dongle. The nano gains a new Fitness submenu (right). If you’re a Nike+iPod user who uses a wireless heart-rate monitor or remote, you’ll still need to use that dongle. But if you mainly use it to track your workouts, the sixth-generation iPod nano—purchased new, or updated to the 1.2 software—just became a lot more interesting. For the first time that I can recall, Apple updated an iPod model at its annual fall event but provided all of the new features to the previous-year’s model through a software update. (To be fair, the “new” nano isn’t really new—it’s simply last year’s model with new software. But that in itself is notable.) This means that if you’ve purchased an iPod nano in the past year, there’s no reason to consider buying a new one. But it also means that if you’ve got a nano purchased since last fall, you’ll definitely want to install the 1.2 software update—it’s a no-brainer.